The Earth is a beautiful and amazing place. With our current means of travel by air, land and sea it is still a very large place and getting from point A to point B takes time. We arrived yesterday around noon (New Zealand time), picked up our rental car and drove to the hotel. The minute I saw the location of our hotel I let Linda know we would be renting a car. On our last visit our hotel was downtown Queenstown. This visit our hotel is east of the town and across Lake Wakatipu. To make matters worse there is road construction on the highway between the town and the hotel. We opted for a rental car and I'm already glad we did so. As usual the first day on a Travel Award Trip is dedicated to a required Financial Advisor meeting. After 25 years I'll never understand why some FA's feel that this meeting is actually a place to ask questions therefore, delaying our exit from said meeting. The spouses join us after an hour or so and we do introductions, when we started at Edward Jones, and what we plan on doing in New Zealand. Our introduction is simple and got a few ohh and awe when I mentioned that we had extended to hike the Routeburn Track. Required Edward Jones meeting over and the requisite Linda's Brick Barn annual corporate meeting completed as well, we decide to skip the free Queenstown city tour and head to Coronet Peak. Part of the free tour will bring the bus through Arrowtown and on to Coronet Peak, but we wanted to climb to the summit and that was going to take some time, more time than the bus would allow. Coronet Peak is a ski area that sits high on the grassy mountain side, almost directly north of Queenstown. Getting there is a rounding circular loop through Arrowtown and Arthurs Point. We had visited the peak ten years ago on our first visit to New Zealand, and I was anything but impressed. It looked like a bunny hill of rolling peaks. Now that we start our hike, I realize how wrong I was. Coronet Peak is the summit and the chair lift (not running) goes all the way to the top. I had downloaded a GPS track and we were off. Rounding the Ski Lodge, both Linda and I marvel at the size of the decking area. Now this is a sun deck and we both wish our local resort had such a set up. A massive cement slab which probably holds 50 tables is located between the lodge and hillside. A lone worker is moving some dirt and we approach to ask directions. The man is super nice and helpful as he points us in the right direction with a word of caution that the trail is a single track mountain bike trail and very popular. We walk a short distance along the maintenance road and recognize the bunny hill. Linda's keen ski instructor eye picks out the various terrain as we walk along the edge. We drove to a high altitude before we started the hike, and already the view is spectacular. We hear talking and move off the trail as a team of mountain bikers go past. The hillside is steep and there is not a lot of room on the single track trail. The rolling hills are massive and Linda and I guess as to the degree of difficulty. Here in the states we have simply green, blue, black (diamond) and double black diamond. New Zealand has a 4th option between blue and black which is red. Like most ski resorts, the main area of the mountain is hidden from the view. Probably the most interesting and unique feature of the hillside to us is the captive pockets that dot the hillside. Captive in that if you ski into the pocket there is no way out without climbing up another hillside. This is something we don't have at Brian Head and as we switch-back along the ridge of one of these pockets we comment how hard it would be to extract yourself from the area. Most ridges in our area have a built in exit formed by water running and eroding into a wash, but here the indentations appear to be a permanent part of the landscape. The ski is overcast and we move aside for a mountain biker making her way up the trail. We are nearing the top, and we continue to comment on making a return trip during the New Zealand winter to ski this interesting terrain. The summit is a rocky peak behind the upper ski lift exit and we hike up the last few feet. A trail complete with handrail is located here and to the summit. A true peak, the view in all directions is spectacular. Other trails exist to this summit and we pick out several as they wander along ridge lines of grass and stone. Rather than traverse the mountain bike trail again, we hike down the slope and maintenance road. As we approach the chair lift starts to run, we are hoping for a ride down, but it is probably scheduled maintenance and only runs for a little while. The road is steep with gravel and makes for a slip and slide motion, but we are making good time and arrive back at the parking lot faster than our ascent. 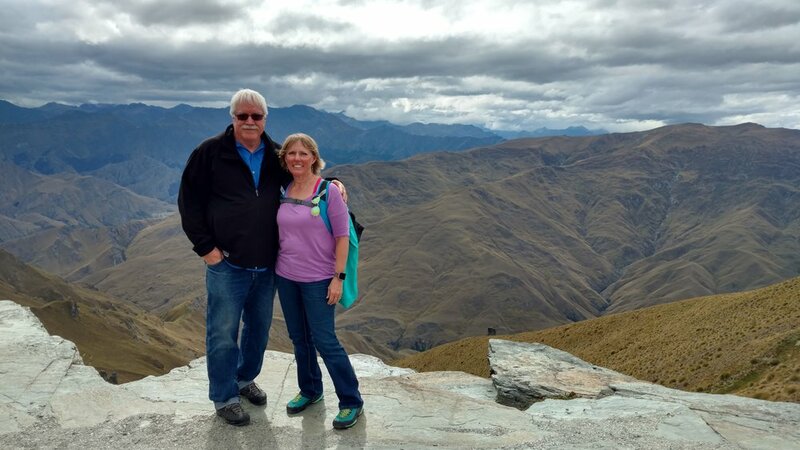 A couple viewing the area agreed to take our picture in the Coronet Peak chair as a reminder of our summit adventure here.